Colors Bright lavender in color, occasionally white. Shapes Rough textured, variously shaped from roughly oblong to curvaceously twist depending on specific varieties. Dioscorea alata commonly known as purple yam is actually a species of yam, a tuberous root vegetable. Purple yams are similar to sweet potatoes and are known by several names, including purple yam, greater yam, winged yam, water yam, white yam, purple or white yam, guyana arrowroot, ten-month yam. However exact place of origin is unknown it is believed that common yam comes from the islands of Indonesia. The tubers are usually bright lavender in color, hence the common name, but they may sometimes be white. 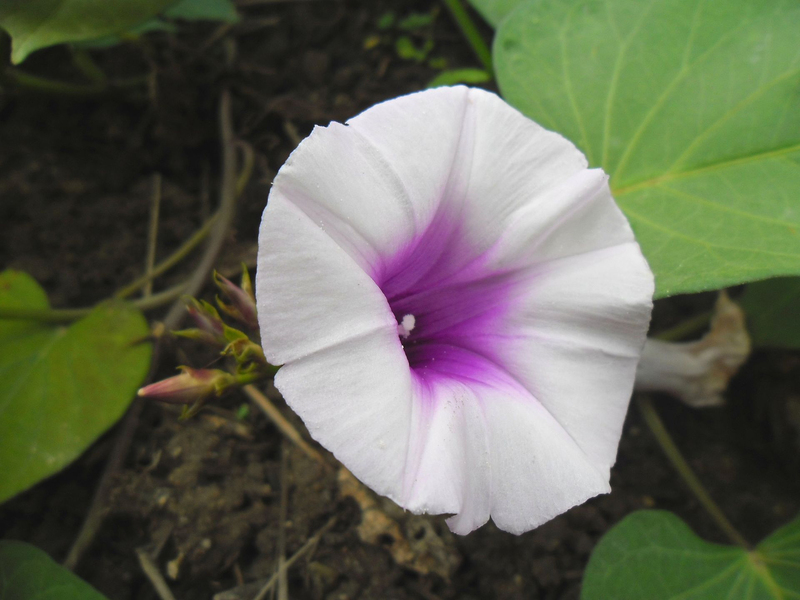 It is sometimes confused with taro and the Okinawa sweet potato (Ipomoea batatas cv. Ayamurasaki), although D. alata is also grown in Okinawa where it is known as beniimo. 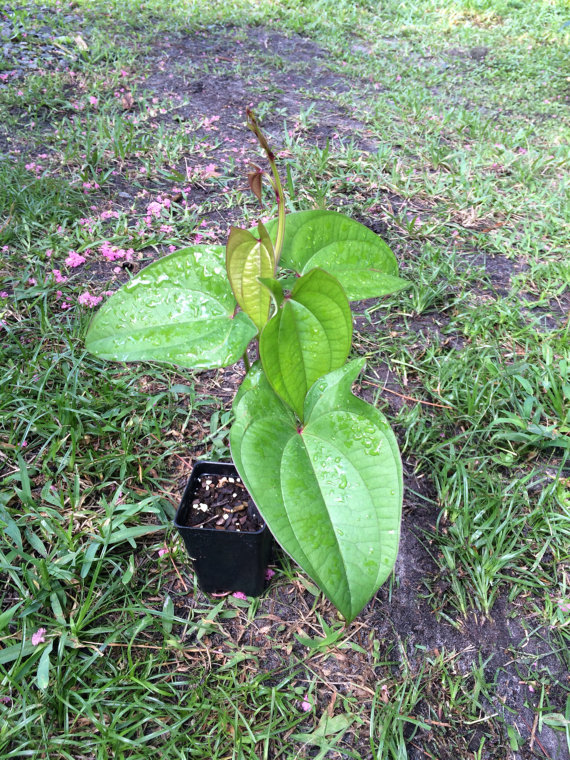 With its origins in the Asian tropics, D. alata has been known to humans since ancient times. Purple Yam is a fast-growing, twining, tuberous-rooted, herbaceous perennial vine and is normally about 20-25 meter tall with supporting tree. It is found growing widely in the tropical and sub-tropical regions of the world and is found growing in a fertile well-drained soil. The plant has tumorous root called yam, often with small axillary tubers as is used as vegetable. Stems are purplish in color and square shaped and slippery while green on the stem or leaf. Leaves are large, bright green and tapered at the end up to 25cm. long, heart-shaped. The veins are marked. Flowers are arranged in clusters, and bloom at irregular times. Purple Yam is an earthly, healthy and delicious food. Purple yam is a tuber with rough textured, dark colored grayish brown skins and purple flesh. Flesh color may differ from white, yellow or purple, depending on variety. Tubers are normally rough textured, variously shaped from roughly oblong to curvaceously twist depending on specific varieties. Purple yam is very twisted looking in appearance and grows on a vine rather than underground. They have mild sweet taste. Purple and blue foods are an excellent source of nutrients. These foods derive their shade from the antioxidant Anthocyanin. It is a very energy defense towards cell damage and attacks on your immune system. They are nutritionally similar to other types of potatoes; they are rich in carbohydrates but low in protein and fat. In the Philippines, it is a major vegetable crop and an important source of food. It is abundant in the last months of the year. And this is why during the Christmas holidays, a lot of desserts and snacks in the Philippines are made of purple yam. It is used in a variety of desserts, as well as a flavor for ice cream, milk, Swiss rolls, tarts, cookies, cakes, and other pastries. At the moment, there are over 600 species of yam (Dioscorea spp.) Making it difficult to determine its origin. It is supposed that common yam comes from the islands of Indonesia. Historically, it spread from Asia to the African continent, where it was exported to America through the slave trade. At present, the world’s leading producer in West Africa, followed by Southeast Asia, Pacific Islands and Caribbean region. Apart from their mild sweet taste, purple yam is a good source of nutrients, vitamins and minerals. Consuming 100 gram of purple yam offers 0.29 mg of Vitamin B6, 27.89 g of Carbohydrate, 0.18 mg of Copper, 17.1 mg of Vitamin C, 816 mg of Potassium, 4.1 g of Total dietary Fiber, 0.11 mg of Vitamin B1, 55 mg of Phosphorus, 0.54 mg of Iron, 0.31 mg of Vitamin B5, 23 µg of Vitamin B9, 21 mg of Magnesium, 0.55 mg of Vitamin B3, 1.53 g of Protein, 0.03 mg of Vitamin B2 and 0.24 mg of Zinc. Purple pigments contained in the purple Yam are related in conducting the blood circulation in the body. Purple pigments that give color to the meat of the purple Yam is called anthocyanin. As discussed previously, the relationships serve as antioxidants that can absorb air pollution. So any blood clots will not occur and the blood circulation in our body become smooth. Fiber and pectin found in purple yam is quite beneficial for proper digestion of the food. Both were helpful in keeping the digestive process in the funnel and digest remain good. So we will be safe from numerous digestive disorders such as hemorrhoids, constipation, and even cancer. 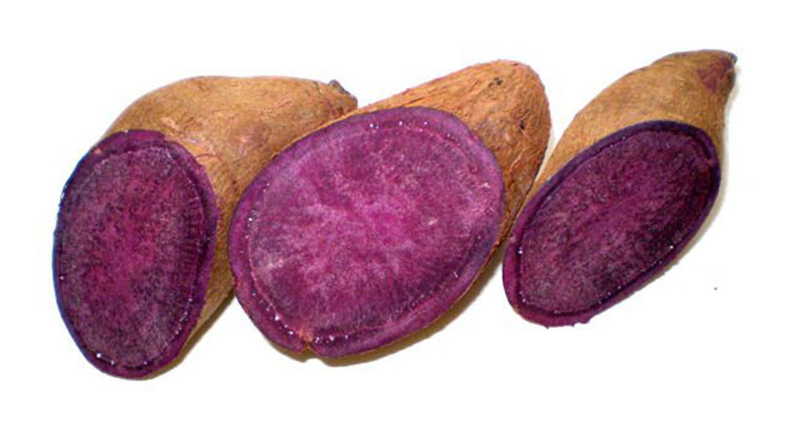 Purple yam contains a high amount of carbohydrate due to which we can easily replace rice. Beautiful purple color can be used as ingredients for the food coloring. Anti-bacterial activity of purple Yam reach 3.2 times higher than various kinds of blueberries. So including purple yam in your regular diet is quite beneficial for overcoming all the bacterial problems. Asthma is not a disease it can be cured, it often decline with routinely consuming purple Yam. Asthma occurs due to pulmonary organs that are difficult to expand. By consuming purple yam on a regular basis, asthma will be cured and does not recurred. Purple Yam or yellow sweet potato has 112 calories without the fat and cholesterol content of sodium. 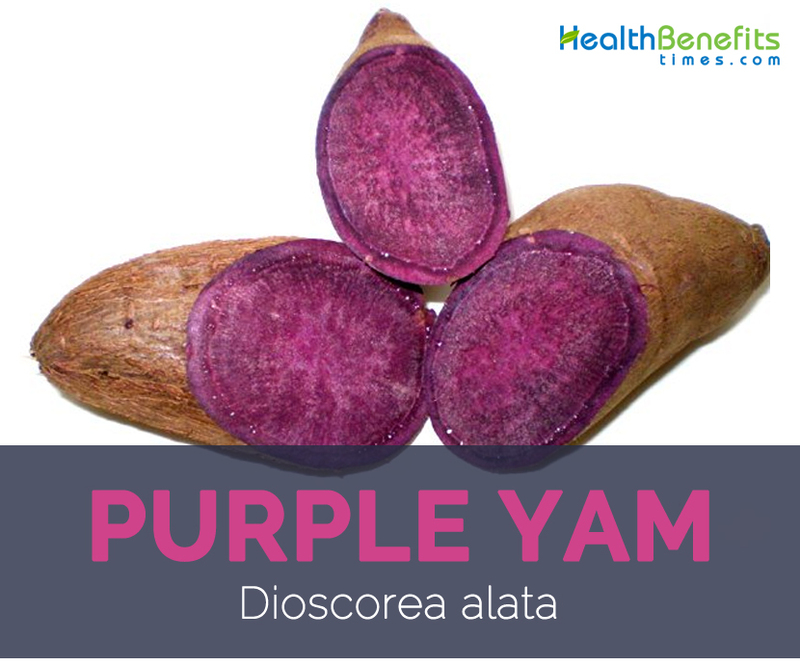 Normally purple Yam is consumed by boiling or steaming which increases its sweet taste but the calories remain low. Purple Yam consists of complex carbohydrates and also has the sweet taste which can help to add weight to your body. Certainly not just consume the purple yam regularly but also comes with exercise and sports. Then the muscles can be formed and your weight will increase effortlessly. Purple yam has 2.5 times higher antioxidant activity compared to different types of blueberries. Because of its higher antioxidant activity it can help to control the cancer cells in the body. Additionally, selenium and iodine content in the purple yam is 20 times higher than other types of ubi. Thus it is quite helpful for overcoming cancer. Apart from boiled Yam and fries, beautiful purple color of purple yam can be used as a natural dye. A wide variety of healthy foods can be made from sweet violet color. We can find numerous recipes where purple yam can be used. Purple Yam can be quite delicious and healthy addition in your food. Purple yam is used in a variety of desserts, as well as a flavor for ice cream, milk, Swiss rolls, tarts, cookies, cakes, and other pastries. In the Philippines, it is known as ube and is often eaten boiled or as a sweetened jam called ube halayá; the latter is a popular ingredient in the iced dessert called halo-halo. Purple yam flour is a widely used food material and is utilized in preparing dehydrated food products. Purple yam papad is an essential food supplement in the Indian dietary context. Stir-fried chips are eaten during religious fasting in Maharashtra. Purple yam is an essential ingredient in Undhiyu. Purple yam is a popular dessert in Jaffna, Sri Lanka. Ube is now making a scene in the American foodie trend. It is now being used to make ube truffles, ube leche flan cupcakes and ube donuts. Tubers may also be pounded to produce flour or starch. Presence of high level of Vitamin B6 in Purple yam reduces depression among women. The pace of converting the carbohydrates present in Purple yam into sugar is very sluggish, hence, helps to curb the increase of blood sugar level in the human body. Purple yam elements prove beneficial for human urinary, respiratory and nervous systems. High manganese content in Purple yam increases the energy level in human body. Purple yam has been used as a vermifuge and laxative in various healing practices. Powdered tubers used as a remedy for piles, gonorrhea, and applied externally to sores. Tuber paste applied on cancerous wounds; used for leprosy, gonorrhea, skin diseases and high blood pressure in Assam. Used to treat diarrhea, frequent urination, cough, diabetes mellitus, burns and scalds. 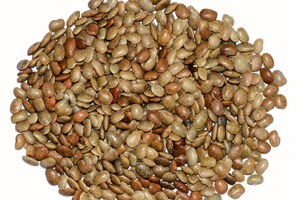 It is used to treat diarrhea, fortify the spleen and kidneys in Traditional Chinese medicine. It is used to relieve dysmenorrhea. Tuber contains allantoin, a cell-proliferant that speeds the healing process. Tuber is used internally in the treatment of tiredness, weight loss, poor appetite, poor digestion, chronic diarrhea, asthma, dry coughs, frequent or uncontrollable urination, diabetes and emotional instability. It is applied externally to ulcers, boils and abscesses. It is also used in stimulating estrogen as well as providing many other benefits [for detail visit Naturaful review]. Purple Yam is used as an ornamental plant for its beautiful leaves. Purple yam is mostly used in food as an important source of carbohydrates. Purple yam is mainly consumed in Asia and the U.S., while other species like D. rotundifolia and D. bulbifera are typical of Africa. However, in some areas where it is common, this tuber has been displaced the sweet potato (Ipomoea batatas) and cassava (Manihot sculenta), plants with lower cost of cultivation. 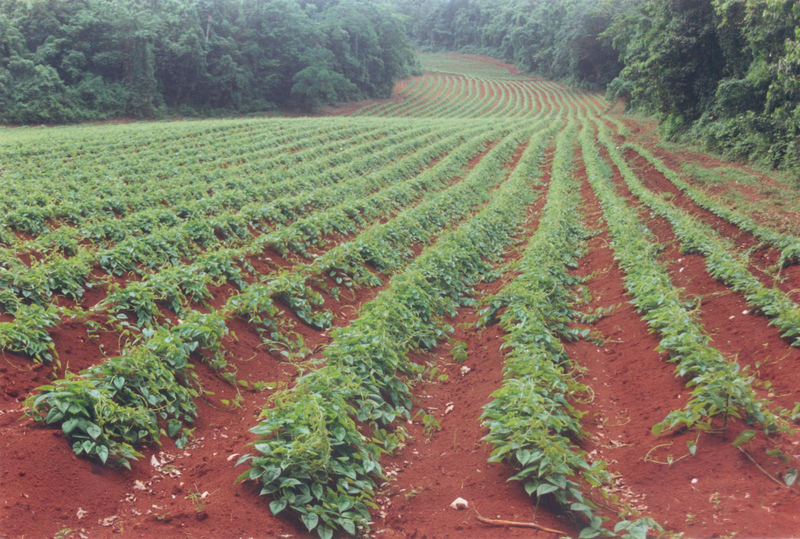 Extra tubers can be used to produce animal feed, though its use is rare due to the high cost of cultivation. The skins resulting from production processes such as yam flour or other products are used for the manufacture of feed for cattle. Recently, yam is being researched for manufacturing fructose sweeteners. This is due to the rising price of corn and sugar cane produced by demand for ethanol fuels made from them. Yam provides good taste and for the production of fructose. Only wild yam (D. villosa) and two cultivated species (D. Composite and D. floribunda) are rich in steroid saponins, which through laboratory processes are converted into raw material for manufacturing oral contraceptives, hormone and cortisone. The winged yam is not used for such purposes as its medicinal content is lower. From yam starch polylactic acid is obtained, which is used to make biodegradable plastics and suture material. 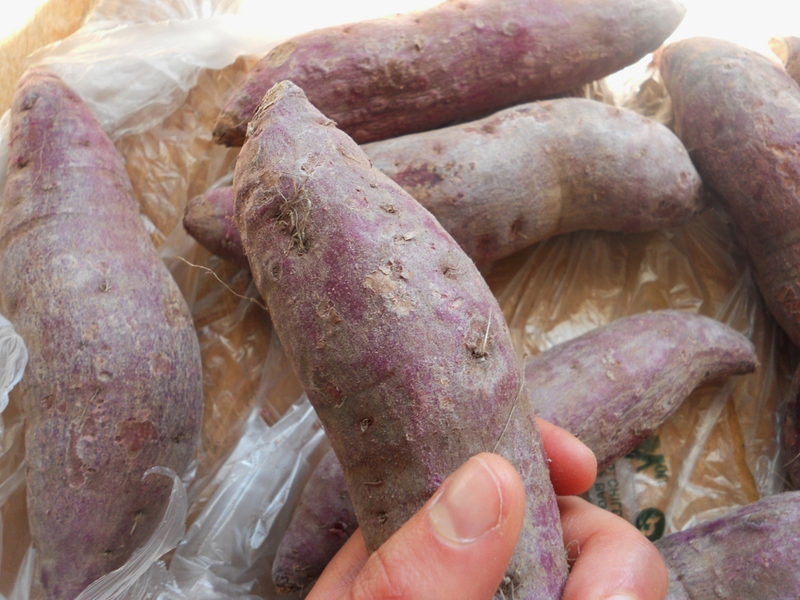 Purple yams are sold fresh in supermarkets or wet markets. Select that are firm and do not have any cracks, bruises or soft spots. Avoid those that are shown in the refrigerated section of the produce department since cold temperature negatively alters their taste. Purple yam is used to make ube powder, which is a starchy substance added as an ingredient to sweet baked goods, cakes, ice cream, jams, and curries. All varieties of the purple yam are used to make both sweet and savory dishes as well as ground starchy substances used as flavorings and ingredients for other foods. Purple Yams should be stored in a cool, dark and well-ventilated place where they will keep fresh for up to ten days. They should be stored loose and not kept in a plastic bag. Keep them out of exposure to sunlight since this will cause them to sprout or ferment. Uncooked purple yams should not be kept in the refrigerator. Purple yams are similar to sweet potatoes and are known by several names, including violet yams, ubes, and water yams. Purple yams, or Dioscorea alata, are nutritionally similar to other types of potatoes; they are rich in carbohydrates but low in protein and fat. Purple Yam is an earthly, healthy and delicious food. Purple yams are tubers with grayish brown skins and purple flesh. They taste sweet and a variety of a true yam, which is known as “ube” or “ubi” in the Philippines. It has rough textured, dark colored skin and a light purple colored flesh. Purple yam is very gnarled looking in appearance and grows on a vine rather than underground. It has swollen roots or tubers corms, which are formed from the vines, leaves, roots and stolons of the plant. It is abundant in the last months of the year. And this is why during the Christmas holidays, a lot of desserts and snacks in the Philippines are made of ube. 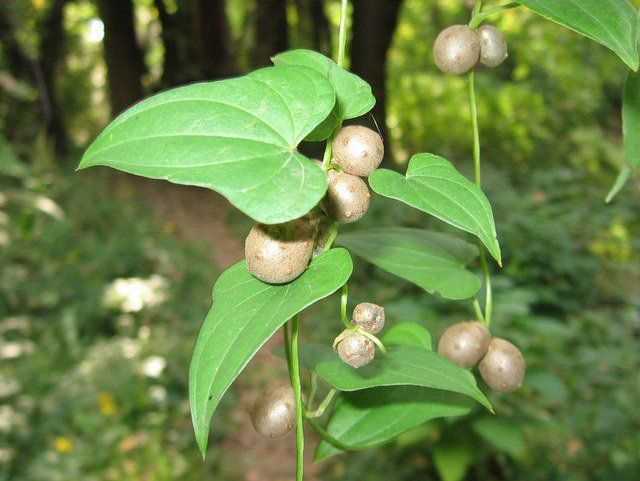 Native Native to Southeast Asia (Indochina, Philippines, Indonesia, etc.) and surrounding areas (Taiwan, Ryukyu Islands, Assam, Nepal, New Guinea, Christmas Island). Common Names Purple yam, greater yam, winged yam, water yam, white yam, purple or white yam, guyana arrowroot, ten-month yam. Name in Other Languages Assamese: Kath alu. Chinese: Mao shu, Shen shu, Da shu. French: Igname ailée, Grande igname, Igname franche, Igname blanche. Telugu: Peruvalli, Perumvalii kilangu, Mullu valli, Yams kallu. Spain: Ñame común, ñame grande, ñame asiático, ñame de agua, ñame alado. Growing Climate Cultivated extensively in the tropical and sub-tropical regions of the world. Stem Herbaceous, purplish in color and square shaped and slippery while green on the stem or leaf. Leaf Large, up to 25cm. long, heart-shaped and bright green. The veins are marked. Tuber Shape & Size Rough textured, variously shaped from roughly oblong to curvaceously twist depending on specific varieties. Tuber Color Bright lavender in color, occasionally white. Fruit Capsule, hard, bright, 2 – 3cm. in diameter. Calories 118 Kcal. Calories from Fat 1.53 Kcal.